If you have ever attended a Nigerian wedding maybe a birthday party in Lagos, a traditional wedding in Abuja, or you have patronized us and partaken of our cakes at WaraCake, then you must have noticed that there is a spectacular glow that goes with our cakes especially our traditional wedding cakes. This is an indication that our bakers put in their best when they bake. you know that apart from baking to get paid, you are actually doing yourself a great favor by baking? Yeah, you are! Apart from the fact that the act of baking is a form of exercise on its own, there are other benefits attached to it. Let’s have a quick look at them. Baking can do more than create yummy comfort food, in fact, it has been found to have therapeutic value which helps to ease depression. You can try it out anytime you feel depressed, enter your kitchen and get hold of your flour, yeast, eggs, baking powder amidst other ingredients and try out a new recipe to bake. You will be surprised that your depression willvanish barely some minutes into the commencement of the activity. Any activity that takes your whole attention especially if it’s simple and repetitive can have calming and meditative quality-this is what happens when you bake. The process of weighing out sugar and butter, whisking eggs, beating and folding, trying out new recipe creates space in the mind and it also eases negative thinking process. During the course of baking, you unknowingly stimulate the 5 senses through the feel of the flour, the sound the mixer makes while mixing, that pleasant smell that emanates from the oven, the taste of the delectable final product (you would have tasted one or two times while preparing though), and of course the pleasurable sight that the final product gives. The final product depends on how these 5 senses were stimulated while the preparation was on. Just like cooking, baking is aimed at nourishing ourselves and others. As such you will have to bring yourself to the awareness of the best and healthy ingredients to use– thereby exercising your brain. Maybe you haven’t noticed that pleasurable feeling that goes with cake decorating and baking. Yes, baking is pleasurable because it has to do with creativity which in turn brings happiness. You’ll agree with me that if you want to create something new, you will have to task your brain and what you will arrive at afterward will create a pleasurable expression –that feeling of happiness you have after seeing what you have invested your time in producing. No wonder psychologists have drawn a deep connection between creativity and overall well-being. Each and every time you dare to experiment a new recipe and make a pretty cake out of it, you usually have this sense of excitement that goes with the fact that you are about to produce something new and after the final product has been realized, you will have a sense of happiness. More like yeah, this is my handwork ! I made this happen! You feel fulfilled that you have produced something good. 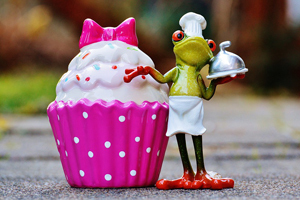 So, why not stop thinking of the stress and think about the benefits you can derive from baking? Bake a cake today, it’s good for your health! Our bakers know this at WaraCake that’s why we are a set of professionals. Reach out to us at www.waracake.com/shop or ring ( +234 814 627 4960 or info@waracake.com ) and you will be glad you did. This entry was posted in Uncategorized and tagged baker, baking, birthday, blog, cake, waracake.